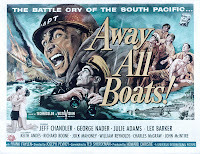 My husband and I watched AWAY ALL BOATS this weekend; it's an old favorite of his, but I'd never seen it before. I can see now why he likes it so much, as I thought it was a terrific WWII film with a superb cast. The movie begins early in WWII, as Captain Jebediah S. Hawks (Jeff Chandler) takes command of the USS Belinda, a Navy transport ship. It's Hawks' job to turn a bunch of fairly green Navy recruits into an efficient fighting force. Hawks is a tough taskmaster, but it's up to him to make sure the Belinda stays afloat and his men stay alive so they can play their roles in the Pacific campaign. In some regards, AWAY ALL BOATS might be thought of as a much more serious version of YOU'RE IN THE NAVY NOW (1951). Chandler as Hawks effectively portrays both a confident leader and a lonely man who cannot become friends with the men for whom he is responsible. It's fascinating watching him and seeing the effect he has on the men under his command, such as immature Commander Quigley (Lex Barker), who starts out clearly appreciating the relative glamour of being an officer, but not the responsibility. It's eventually clear that while Hawks may seem cold and intimidating, he has an appreciation for the contributions of each man on the crew, including the goofy guy in charge of grinding up the garbage so that the ship doesn't leave a trail for the enemy; he also has a good understanding of group psychology. It's an excellent part, and Chandler makes the most of it. I found the conclusion slightly melodramatic, given the film's matter-of-fact attitude up to that point, but all in all this was a really well-done, highly engrossing film. Any movie with a cast including Richard Boone, Charles McGraw, John McIntire, Julie Adams, Jock Mahoney, Arthur Space, and Frank Faylen has got to be pretty good, and indeed it is. 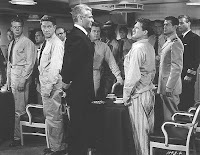 McIntire's only in one scene and Adams is seen only at the opening and in a flashback, but I appreciated that even small roles were cast with top actors. Keith Andes, George Nader, William Reynolds, and James Westerfield are also among the large cast. David Janssen and Clint Eastwood, then on their way up the career ladder, are credited with bit parts at IMDb, but I didn't spot them on this viewing. The screenplay by Ted Sherdeman was based on the novel by Kenneth M. Dodson. 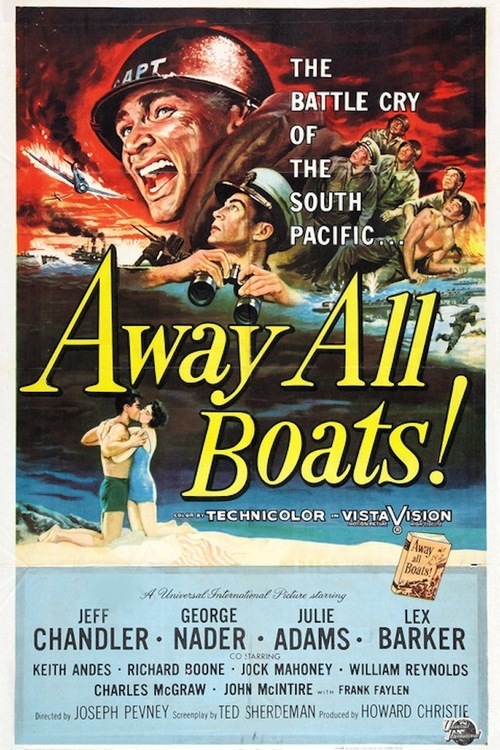 AWAY ALL BOATS was directed by Joseph Pevney and filmed in VistaVision by William Daniels. It runs 114 minutes. I'm very fortunate I was able to see the movie, as these days this is a relatively difficult film to obtain. 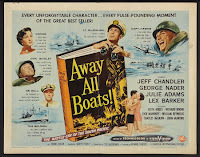 AWAY ALL BOATS was released on VHS back in 2001. A DVD release of the same year is long out of print and very expensive. It is available in Europe on Region 2 DVD. This is a title which really needs to be released in the Universal Vault Series; it's an excellent film with a top cast which was beautifully filmed, and I suspect it would be a very popular release, especially if the print is of the high quality typical of the Universal Vault DVDs. 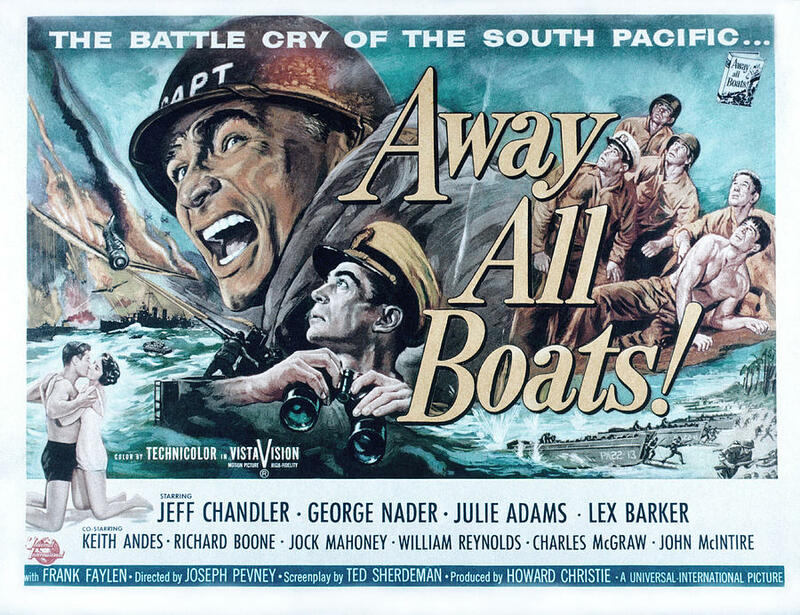 Viewers who love World War II films, Jeff Chandler, and/or Universal movies of the '50s should find this film to be great entertainment. Highly recommended. This is my favorite Jeff Chandler movie. I got a DVD on ebay for $6.00, it was a factory overrun, so all I got was the DVD, no packaging. Excellent bargain! The DVD is not in VistaVision, it's either pan & scan or scrunched to fit the screen. The kamikaze scenes lose a lot of punch. The Julie Admas part really makes no sense, they just *had* to squeeze in a female if only for a few minutes. Nothing against Julie Adams, but I fast forwarded the few minutes she was on screen because it was just a plot interuption. The book is even better than the movie! As I read your review, the memory of how glorious Jeff Chandler looked in Navy Blues seemed to float back into my consciousness. Other details of this film, which used to be aired about once a week on the tube, have long since blurred, though I seem to remember some confrontations between the suitably gruff Jeff and his men in the ward room. It is odd that this hasn't found its way to a Region 1 DVD prior to this, but I'll try to look for it soon. Thanks for spotlighting this film, and reminding me of Chandler's presence, Laura. 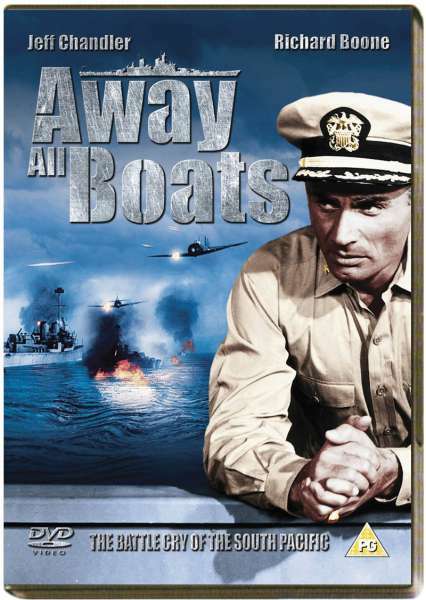 I love AWAY ALL BOATS too, but I must agree it needs a proper DVD release preserving the VistaVision format. Something about VV may cause a problem when shown full frame because when I saw it on AMC sometime ago, some of the sound seemed lost, or at least muffled. No love from you, Laura (or anyone) for George Nader? He is a co-star here and has a role effectively equal to Jeff Chandler's, and I think he is just as good as Chandler--I like Julie Adams being in it briefly as his wife just to add something to his character. Nader is forgotten I know but he had a nice run on his Universal-International contract beginning as one of the four outlaws in FOUR GUNS TO THE BORDER and I believe peaking in AWAY ALL BOATS and later the same year in THE UNGUARDED MOMENT (now on DVD), excellent melodrama in which Nader plays opposite a non-swimming Esther Williams, who is very good. I wasn't sure what you meant about the ending, unless it's what happens to Chandler. What happens to the ship itself is believable and a well-sustained lengthy sequence without any special dramatic pumping up in which they deal with catastrophe and for me made a terrific climax. I'm delighted to know this movie has other fans! (And you're certainly right, Moira, about how good Chandler looked in his uniform, LOL.) I would love to see a DVD in the proper widescreen format. Blake, you guessed correctly, the issue I referred to regarding the ending is what happens to Chandler's character. Up to that point I was fine and loved seeing how they dealt with the problems at hand. The spiral and ultimate outcome for his character surprised me. I guess Nader didn't make much of an impression one way or another on this viewing. (Maybe I was distracted watching all the other great faces, especially McGraw, grin.) Not sure I'm familiar with him other than FOUR GUNS TO THE BORDER. I did like Julie Adams being in it to personalize his story a little, though the flashbacks almost made me think that what happens to Chandler would happen to Nader instead! I also have the TCM set with THE UNGUARDED MOMENT so I'll see more Nader when I watch that! hmmm.... the ending. I have not finished the book yet. I'll get on that right away and compare book vs movie ending without a spoiler! It may just be the way they wrapped up the movie version but it's all believable in the book. The novel is so good I am not skipping ahead, even though I know the story. If you check user reviews for both the novel and film on Amazon, you will find many admiring reviews from Navy people. That's a good endorsement. I recognized Joseph Pevney's name, but couldn't remember where. Sure enough, after checking with IMDB, I just had watched the 1947 version of Body and Soul this past week and Mr. Pevney had a big supporting role as John Garfield's boxer's best friend, Shorty. I was very impressed by his performance, but didn't realize he only appeared in a few film and his forte was actually directing. with Charles McGraw is worth watching. Hopefully as you said, Universal will find a way to release it on DVD. I'm really interested in seeing it after reading your review. Joseph Pevney played Shorty but was clearly taller than the star.